•	Our annual Christmas Party will be held on Tuesday December 11th at the Shang Hai Chinese restaurant. The meeting will include a Yankee Swap. If you or a guest would like to participate in the Yankee Swap, please bring a wrapped gift with a value not to exceed $15.00. •	The meeting on December 11th will be the last meeting of the year. Beginning in 2019, club meetings will be held on the 4th TUESDAY of the month at the Shang Hai Chinese restaurant. •	The annual Market Basket Food Pantry shopping will take place on Saturday, December 8th at 8:30 am. 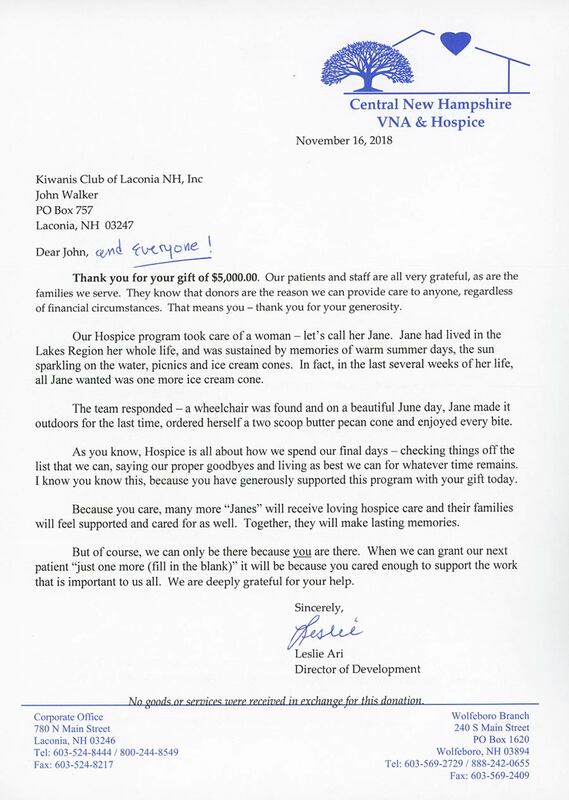 Bill also reported the Club received a thank you letter from Central New Hampshire VNA & Hospice for our recent donation. To read that letter, “click” here. 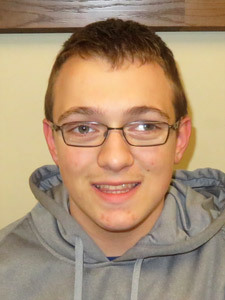 Betty Ballantyne reported, thanks to the generosity of Chris Irwin, Irwin Motors has agreed that Laconia Kiwanis would be a recipient of the proceeds from the Lincoln Driven to Give Day. 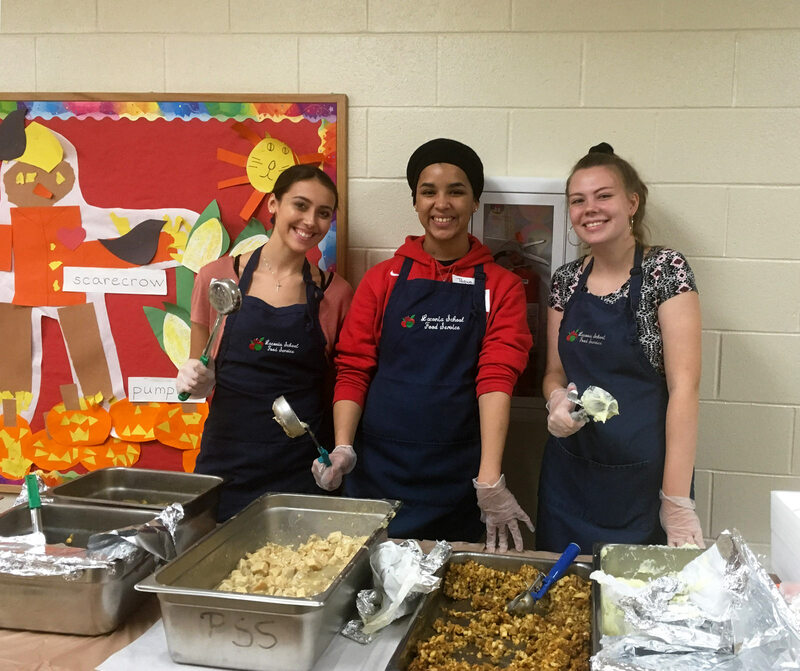 Lincoln Driven to Give Day is designed for Lincoln dealerships to partner with local or national community organizations and non-profits. 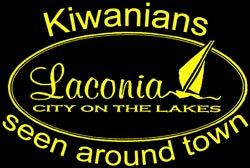 The Laconia Kiwanis Club will receive $20 per test driver for that day. No date has been set for this annual event but we anticipate it may be sometime this Spring. 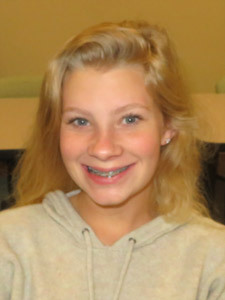 Kathy Calvin reminds the members to SAVE THE DATE of Saturday, December 22nd. That is when the Laconia Kiwanis Club is scheduled to ring the bell in downtown Laconia (across from Citizens Bank) for the Salvation Army. In view of our limited number of members, club members are encouraged to invite a guest to ring with them. The guest can be a family member, a former Kiwanis member, a neighbor, or fellow employee. If you would like to add your name (and the name of a guest) to the list below, please indicate the time preference and “click” here to send an e-mail to our bulletin editor. Your preference will then be updated into the schedule listed below. Betty Ballantyne introduced our guest speaker, Randy Brough, the Director of the Laconia Public Library. 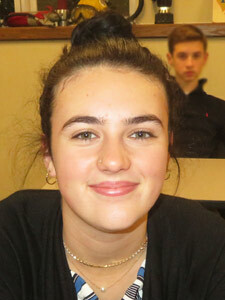 Randy grew up in Laconia and graduated from Laconia High School in 1975. 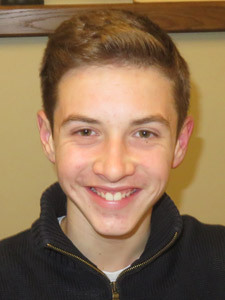 He graduated from William & Mary College and received his graduate degree from Louisiana State University. 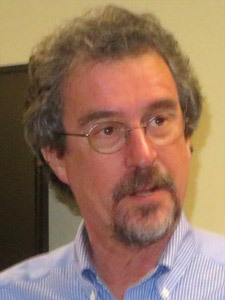 He has been the Director of Laconia Public Library since 2001. Randy gave a brief history of the library and then talked about programs and services that are currently offered. 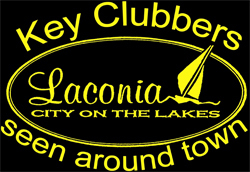 For detailed information on the Laconia Public Library, visit their website by "clicking" here. Randy Brough is congratulated on his enjoyable presentation by Betty Ballantyne. For several years, Betty Ballantyne has been involved with the LRGHealthcare Red Dress Gala, an annual event that raises money to support cardiac services and technology at LRGHealthcare. 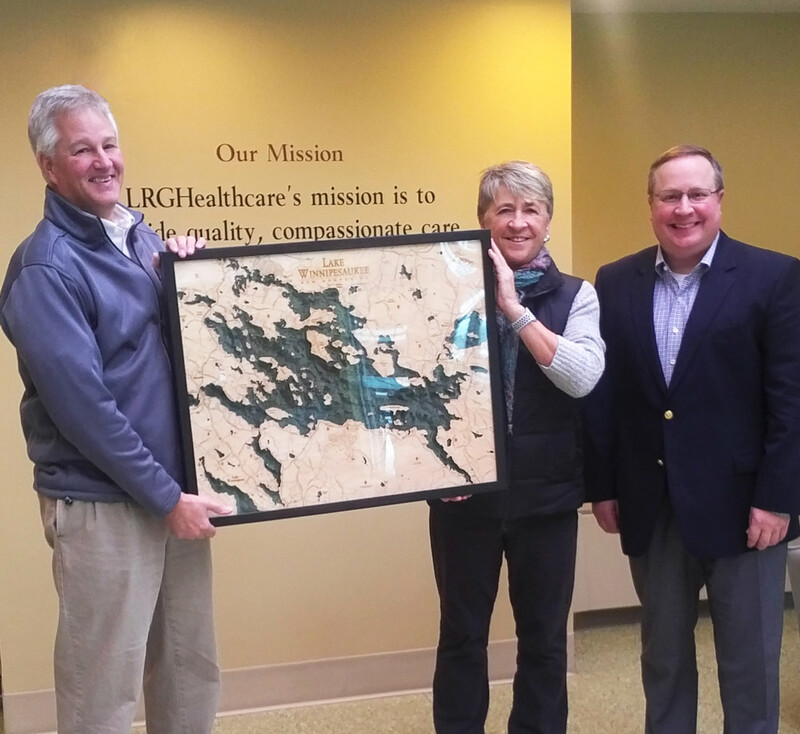 This year, thanks to the generosity of Bill Irwin of Irwin Marine, Betty secured a unique gift for the Gala’s silent auction - a 3D map of Lake Winnipesaukee. For more information on the Red Dress Gala, which will be held on February 8th at Church Landing, “click” here. Congratulations to Denoncourt, Waldron & Sullivan, PA for being recognized as a “committed community partner” through their support of the Belknap Economic Development Council. 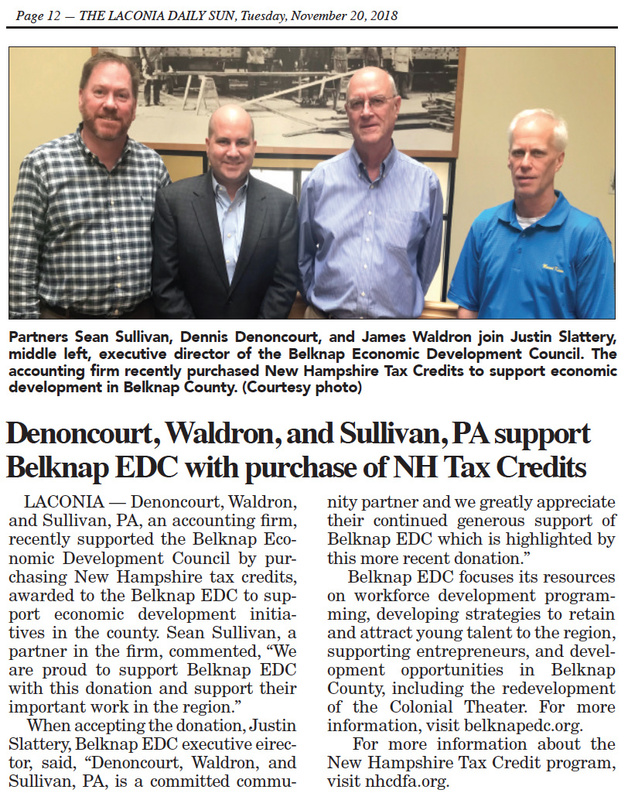 Denoncourt, Waldron & Sullivan, PA recently purchased New Hampshire Tax Credits to support economic development in Belknap County. 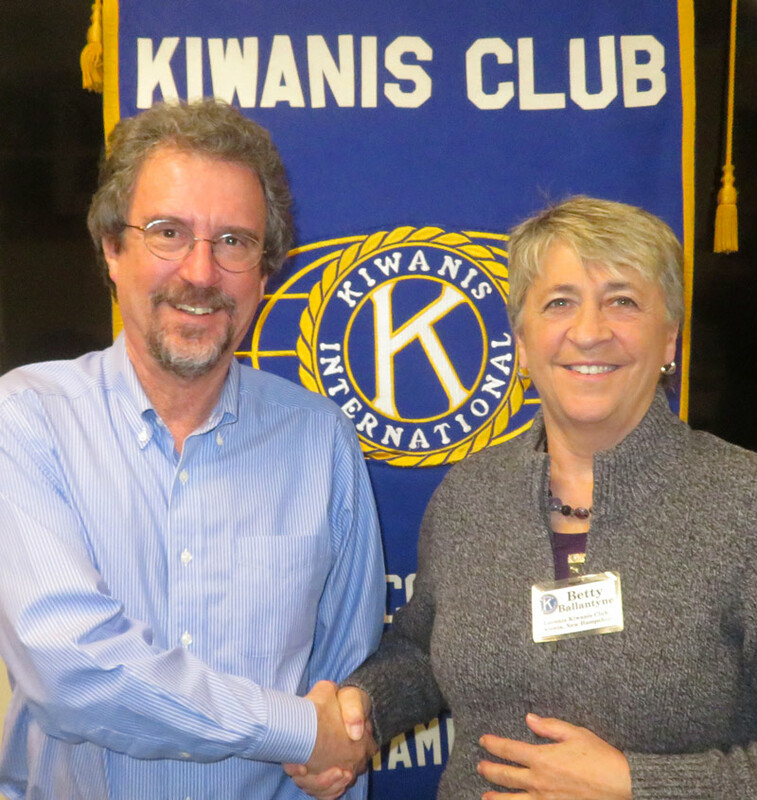 Dennis Denoncourt, a partner in the CPA firm Denoncourt, Waldron & Sullivan, PA, has been a member of the Laconia Kiwanis Club since 1981 and was President of the club during the 1985-86 term. 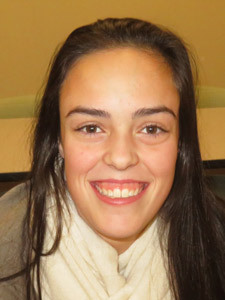 Thank you, Dennis Denoncourt and the partners of Denoncourt, Waldron & Sullivan, PA, for giving back to the community. 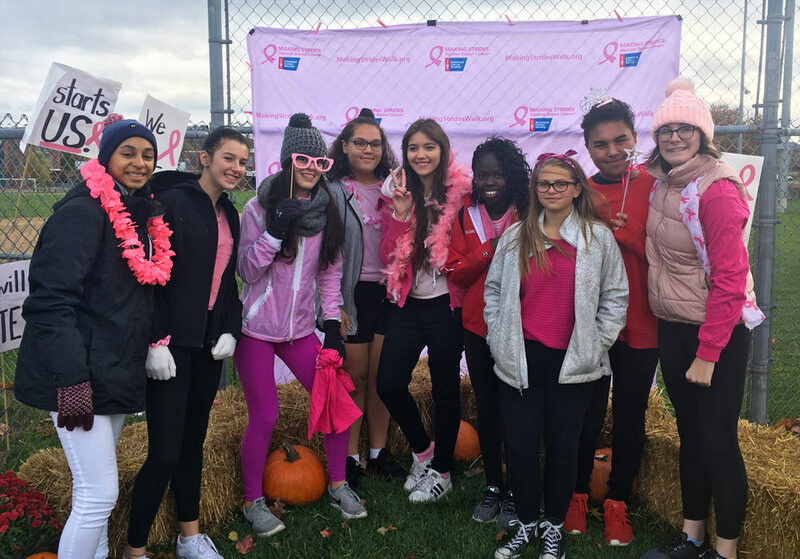 To read the story that appeared in The Laconia Daily Sun on 11/20/18, “click” here. Can you find veteran Laconia Kiwanis Club member Dennis Denoncourt in this picture? Click on any picture below to open a larger picture. 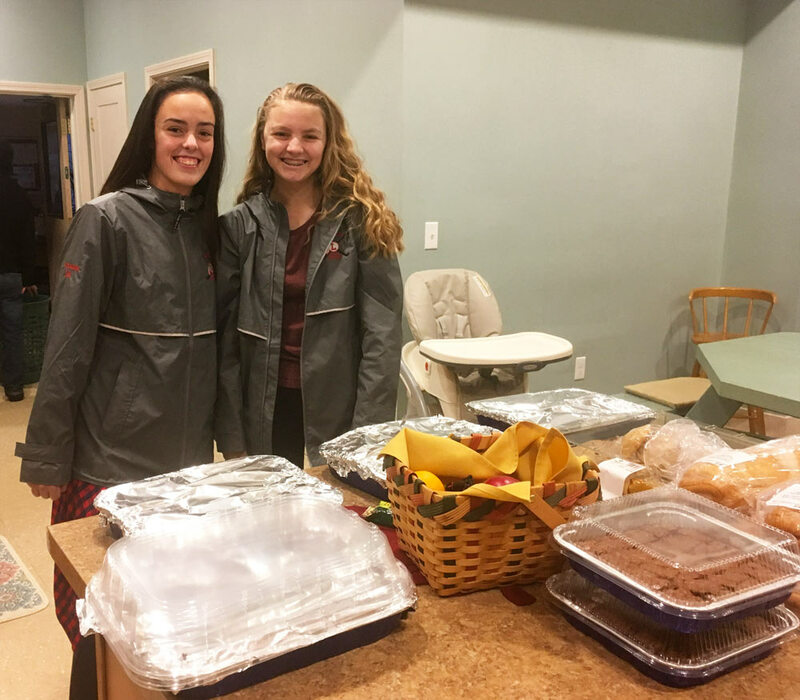 To read the story that appeared in The Laconia Daily Sun on 11/15/18, “click” here. 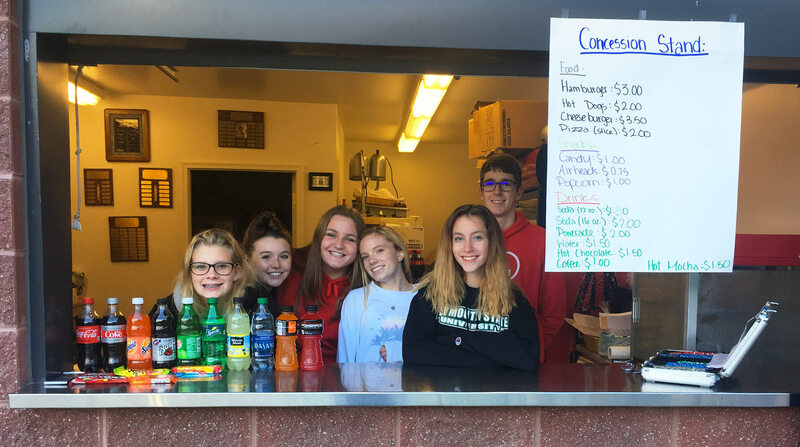 9:00 am - 5:00 pm - Ring the Bell for the Salvation Army - Please review the sign-up sheet above.